I've been trying this year to keep up with my scraps by constantly cutting them into strips - using the sizes 1.5", 2" and 2.5". I worked very, very hard early n the year and did an incredible amount of cutting and sorting. Since then, I've not had as much to cut up. 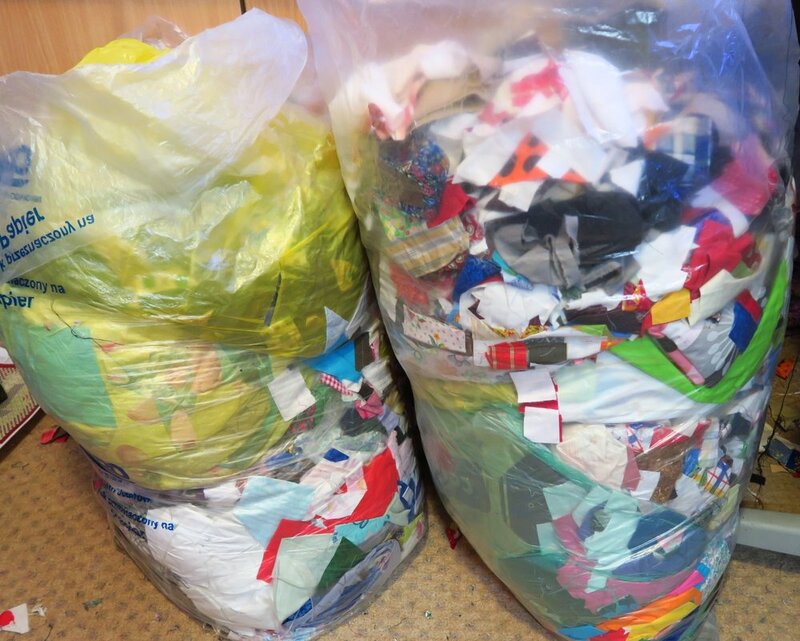 In October, I went back through my sewing room and sorted and cleaned up and threw a bunch of scraps into 2 big trash bags. TWO BIG TRASH BAGS! Yes. Hanging head in shame--I have a bunch more to sort and cut. I have cut up just a tad bit this month - since early September, really as we were gone a lot in September and then I've not focused on doing this in October. But I will hop back on the bandwagon and get busy with this. These two big bags are sitting in my sewing room - in my way. I need to deal with them. I will try to have these two bags dealt with by the end of November, though. They are seriously hindering progress. If you are new to reading here - you may think I'm lying or exaggerating. However, I'm not. These are the real totals by weight of what I've cut up this year. These strips are the reason I've resorted to making so many scrap quilts - esp. the 2" ones. I need to stop and make a couple of 2.5" ones as well. And that's what's happening in my part of the world today! Looking for some special fabrics? Be sure to check out what my sis has for you!